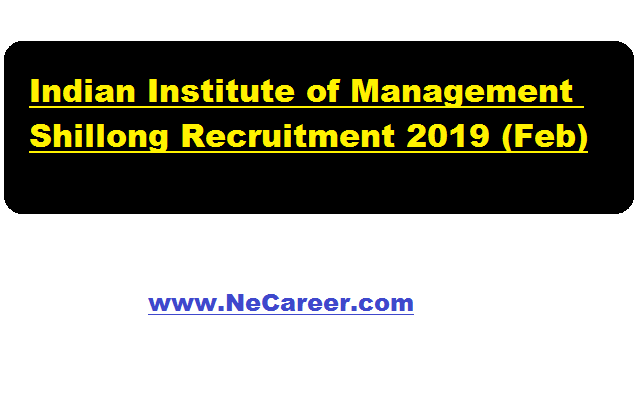 Indian Institute of Management Shillong Recruitment 2019 February :- Hello Job seekers. You are browsing North East India's No. 1 Job Portal NeCareer.com . IIM Shillong has issued a job notification in the month of February 2019. Applications are invited from eligible candidates for various vacant Research Assistant (RA) positions for the Dr. APJ Abdul Kalam Centre for Policy Research and Analysis for a period of 1 (one) year. Candidates should have some familiarity with the North East Region of India.The details of the vacancy is mentioned below. Educational Qualification:- Candidates must be post Graduate Degree in Tourism/ Environmental Sciences/ Economics/ Social Work/ Rural Development/ Computer Sciences. Candidates with Good Research Experience either independently or associated with any research projects/ research Institutes will be given preference. Interested and eligible applicants are requested to forward their CV/ Biodata along with supporting documents to the Centre Coordinator, Dr. APJ Abdul Kalam Centre for Policy Research and Analysis, IIM Shillong on or before 27 February 2019.